Used by permission: From The Vegetarian Times, January 2007. A terrific sandwich for a light evening meal or a hearty lunch! These tempeh reubens will satisfy your every desire for delicious! Thinly sliced tempeh simmered in a flavorful broth makes a great sandwich “meat” in this deli classic. You might want to look for Follow Your Heart vegan cheese, which seems to melt better than other brands we've tried. To prepare Seasoned Tempeh: Combine liquid aminos, onion, garlic, bay leaf and 2 cups water in saucepan over medium heat. Add tempeh slices, and bring to a simmer. Reduce heat to medium low, and simmer 20 minutes. Cover, and let tempeh cool in broth. To make Thousand Island Dressing: Stir together mayonnaise, relish and ketchup in small bowl. To make Sandwiches: Toast 8 slices bread. Set aside. Drain tempeh, and discard liquid, onion, garlic and bay leaf. Place 3 slices tempeh on each slice of remaining bread. Top with cheese slices. Toast or broil 3 to 5 minutes, or until cheese has melted. 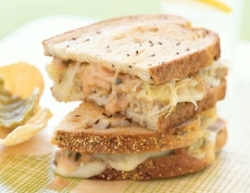 Top each sandwich with 1/4 cup sauerkraut. Spread toasted bread slices with Thousand Island Dressing. Place tops on sandwiches, and slice in half.